Get the most out of your air conditioner or heat pump with a properly matched evaporator coil from Trane. Whether you need an A/C evaporator coil, furnace coil, or a matched heat pump evaporator coil a Trane certified specialist can help you choose the best option for your HVAC system. 100% foil insulation provides easy cleaning and quiet operation. The two-way, sloped, noncorrosive drain pan prevents standing water, which significantly affects indoor air quality. And the all-aluminum, rust-resistant construction keeps the evaporator coil nearly corrosion-free, making it tougher on preventing leaks. Makes cleaning and servicing easier, which in turn leads to higher efficiency and longer life. 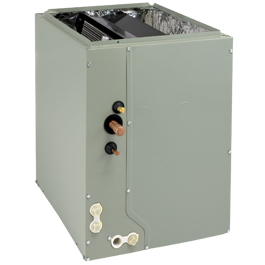 Our evaporator coils provide increased protection from rust and corrosion and matches your furnace color.